Pushkin was one of the very first Russian writers to take a serious interest in Russian folklore. Once I was confident of my ability to translate these skazki, I knew that the book should begin with Pushkin, that it should include a large selection of oral tales collected by Afanasyev and other folklorists, and that it should end with my translations of Platonov. 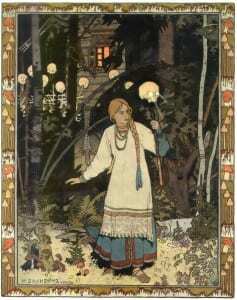 There has always been interplay in Russia between high culture and folk culture, so it seemed right to include both genuine oral folktales and literary retellings. As well as Pushkin and Platonov, I then chose to include Pavel Bazhov, whose tales drawing on motifs from the folklore of the Urals have been hugely popular in Russia throughout the last seventy years. I also included several stories of a somewhat different kind by Teffi, who retained a deep interest in Russian folklore throughout her life. I chose not to include Aleksey Tolstoy’s well-known versions of traditional tales because I felt he had not brought anything new to them; all he had done was tidy the tales up a little. I hesitated for longer over Boris Shergin’s attractive versions from the far North of European Russia; in the end, though, I omitted these too, thinking that Shergin’s contribution to these tales was at the level of surface ornament rather than of true insight. As for genuine oral folktales, I ended up with three sections: tales collected by Afanasyev and his younger contemporary Khudyakov; tales from the folktale collections published in the early twentieth century, during the second great wave of interest in Russian folklore; and tales from collections published during the Soviet era. Pushkin, Bazhov, Teffi and Platonov, along with three sections of oral tales, meant a total of seven sections: an appropriate, traditionally sanctioned number! One knows an anthology is going well when one section casts an unexpected light on another section. The particular quality of Platonov’s own skazki became most apparent to me when I began to compare them with the many folklore-inspired works of art and music from the first two decades of the twentieth century – and above all with the works associated with Diaghilev and the Ballets Russes. The mood of Stravinsky’s ballets is one of excitement and violence. The dominant colour of the sets and costumes is a brilliant red; the image that epitomizes this period is that of the firebird. Platonov, however, turns to Russian folklore as a source not of pagan vitality but of what can best be called Christian values: patience, endurance, kindness and forgiveness. And his counterpart to the Firebird is Finist the Bright Falcon. Whereas the Firebird leaves behind her a tail feather that shines as bright ‘as a thousand candles’, Finist leaves behind him the plainest, greyest and most ordinary of feathers; only Maryushka, his ‘destined one’, has the perspicuity to grasp what this feather, with its promise of love and perhaps even of rebirth, is truly worth. The name Finist is derived from Phoenix, the bird that is reborn out of its own ashes; Finist and the Firebird appear to be male and female aspects of one and the same bird. Where Stravinsky and others saw an image of alluring glamour, Platonov saw a symbol of quiet hope, of the possibility of new life springing even from grey ash. Afanasyev’s version, incidentally, makes no mention of the colour of Finist’s feather; in choosing to describe it as grey, Platonov appears – as so often in his skazki – not to be adding something of his own to the oral versions but to be revealing their innermost truth. After that, Ivan wandered from village to village, from the home of one stranger to the home of another stranger. Wherever he went, he had only to promise to tell a story and people would take him in for the night: a story, it appears, is stronger than a tsar. There was just one thing: if he began telling stories before they had eaten, the people listening to him never felt hungry and supper time never came. So the former soldier always asked for a bowl of cabbage soup first. It was better like that. After all, you can’t live on stories alone, without any food. Robert Chandler is a translator and poet. His Russian Magic Tales from Pushkin to Platonov is published by Penguin. He will be talking about Russian Magic Tales at 6.30pm on 4 March 2013, at the Marx Memorial Library, 37A Clerkenwell Green, London EC1R 0DU.